This is a simple experiment to show that microorganisms consume oxygen and give out energy in the form of heat. The apparatus is set up as shown in the diagram. The oxygen and temperature (and humidity) sensors are connected to the DrDAQ data logger, which is turn is plugged into the PC. The fresh grass cuttings are put into the bag. The bag can be put into an insulated bag to prevent heat loss. The temperature sensor is inserted into the middle of the grass cuttings. The oxygen sensor (and humidity sensor) is suspended above the grass cuttings, and the bag is tied around the sensor cables, thus making sure that the oxygen sensor does not fall down into the grass cuttings. A stand and clamp can be used to support the sensor cables. 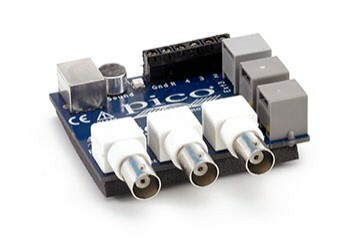 PicoLog is set to record at one sample per minute, with a maximum of 600 samples (i.e. 10 hours worth of data). You can use the temperature sensor on DrDAQ to record the room temperature, so you can check for any large background temperature changes which may have affected the experiment. However, grass cuttings form a good insulator, so this is not very important. The graph is set to show oxygen content and temperature. The spreadsheet is set to show oxygen content, temperature and room temperature. It is easier to view the spreadsheet if it is set to display every 5th or 10th reading once a lot have been taken (click on ‘option’ in the side menu of the spreadsheet display). Note that the temperature sensor on the DrDAQ shows a slightly higher reading than the external temperature sensor before the experiment starts, because of heat given out by the DrDAQ. Once the experiment is set up, leave the sensors to log data for approximately 10 hours. You should start to get a temperature rise within five or 10 minutes, so the experiment can be set for a much shorter (or longer) time if required. What would happen if grass (and other plants) did not decay? How do microorganisms cause the grass to decay? Which two groups of microorganisms are mainly responsible for decay? What are the three main factors required by microorganism to cause rapid decay? The microorganisms are taking in oxygen and returning carbon dioxide to the atmosphere by which process? What may be the reason for the humidity level dropping, then rising, or rising then dropping? What happens when the oxygen level drops to a low level? Further study could involve adding oxygen to the experiment once the temperature begins to drop, or changing the moisture content. Stir the grass cuttings by hand to introduce oxygen part way through the experiment, and see if the temperature starts to rise again. Alternatively, moisten the grass cuttings with water or dry them in an oven at a low heat before the bag is sealed up, to see what difference moisture levels make. Try the experiment as set out here, then repeat it with the bag open to the air, to see what difference access to oxygen at the top makes, or put a tube into the centre of the pile to introduce more air. Grass cuttings do not make very good compost as they do not have structural strength, so collapse and exclude the air necessary for microorganism growth. They also have too much nitrogen for optimal microorganism growth. A better compost mixture contains 50/50 grass cuttings and finely shredded paper or leaves. Investigating optimal circumstances for composting of plant material could form the basis of an interesting project. Certificate in Applied Science (Forensic, Food or Medical Science), Unit 3 "Individual Project"